We have had a hugely busy summer in east London. On the 5th June the Mayor of London, Saddiq Khan, hosted an event to launch of East Bank (formally the Cultural Education District) where we received final confirmation of the commitment of £100m capital funding towards our new east London campus. Speaking at the event Professor Michael Arthur, UCL President & Provost, said: “As one of the world’s leading universities, we address many of the most pressing global challenges of our time. UCL East will take this one step further…Our new campus will bring together seven UCL faculties to generate radical and innovative research and teaching programmes. These will range from robotics, artificial intelligence and media, to innovative finance, global health leadership, advanced propulsion and sustainable cities.” You can read more about the launch on the UCL East website. 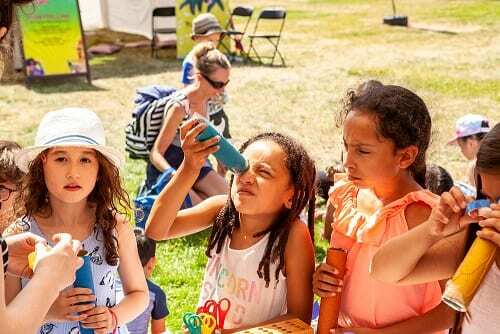 On the 24th June, under the blazing sun in Queen Elizabeth Olympic Park, a dazzling array of kaleidoscopes were about to be made. This all came about as part of our work with UCL Electronic and Electrical Engineering, where we have been thinking about ways in which we can open up the word leading research in the department to people outside of the university, creating a culture of two-way engagement between researchers and the public. First on our agenda was thinking about how we can create opportunities for researchers to try out engagement and have meaningful conversations about their work with different public audiences. The Great Get Together presented the perfect opportunity. We joined forces with artist Emilie Giles to come up with a making activity which researchers from the department could use to start conversations about their research (much of which has a link to light). After consultations with the Public Engagement Unit and researchers from Electronic and Electrical Engineering, a kaleidoscope making activity was finalised, and our team of amazing researchers (Dan, Sherif and Zahra), along with the East Engagement team, headed to the Olympic Park where hundreds of families and young people were congregating. Local families made and decorated kaleidoscopes, using coloured beads and material to diffract the light, while having conversations around research within Electronic and Electrical Engineering. 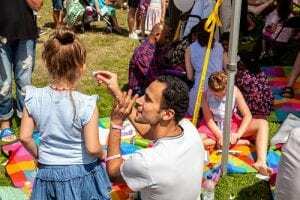 The activity proved extremely popular, and an estimated 450 kids and parents alike participated over the course of the day. So, it was a really busy afternoon, expertly delivered by Dan, Sherif, Zahra and our East Engagement team. Well done to all! sustainability and women-led activism. The 20th June event, later named Humans Make Plastics by participants, was led and designed by London artist Camilla Brendon. 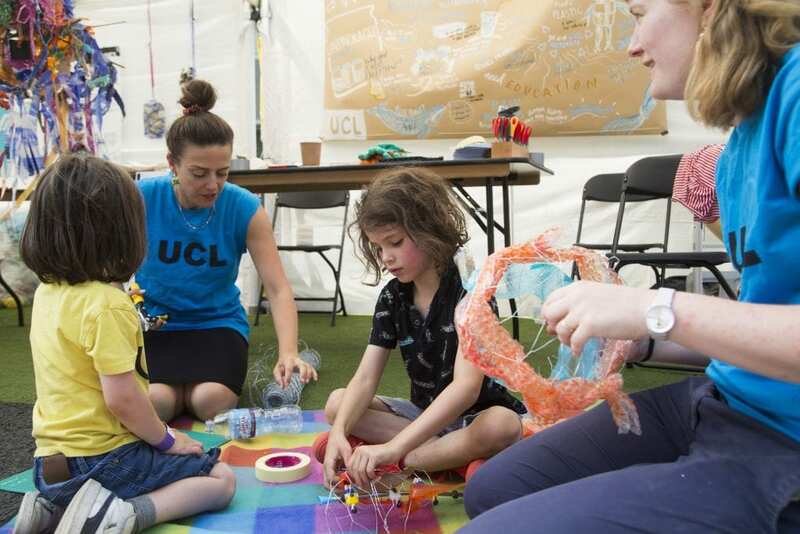 It used plastic pollution (much of it sourced from the River Lea with the support of the Canal and River Trust) to design and build a collaborative sculpture which acted as a tool to talk about the research being undertaken into plastics at UCL. Catherine Conway of Unpackaged also gave a talk about her role in trying to remove plastic from the food and retail supply chain. The final sculpture from the workshop, will also be shown at the Bloomsbury Festival in October.